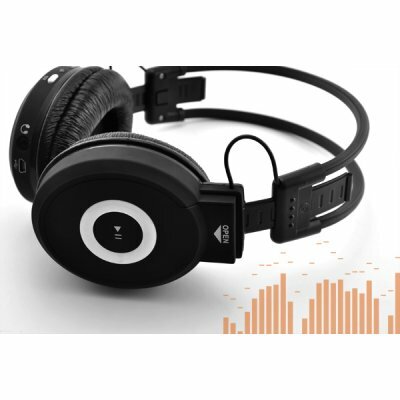 Successfully Added Folding Headphone MP3 Player - Wireless Audio Gadget to your Shopping Cart. Listen to your favorite music on-the-go with this next generation Folding Headphone MP3 Player. This Wireless Audio Gadget is so light and portable you can simply fold it up and carry with you in your backpack or handbag for use at any time and place. The Folding Headphone MP3 player is a comfortable, multi-fit headphone that perfectly envelopes your ears for the ideal listening experience. Shut out everything else and listen to your favorite music artists with the enriched audio quality provided by this audio gadget that can only be heard by you. The Folding Headphone also includes an A-B repeat function and built-in equalizer and that will further enhance your listening experience. Take the Folding Headphone MP3 player with you wherever you go since music is provided by a SD/MMC card (free 2GB card included, supports up to 16GB) and is plug-and-play into your computer for easy transferring of your favorite MP3 files. The headphone is so light and portable you can simply fold them and carry them with you in your backpack or handbag for use at any time and place. It even comes with an LCD screen and one-touch buttons for play/pause, volume up, volume down, previous track, and next track. When not listening to the built-in MP3 player, you can even use the Folding Headphone MP3 Player as a high-quality replacement to your old earphone/headphones. Connect it to your DVD player, laptop, and computer (or anything with a 3.5mm audio in) for a better listening experience. Or better yet, use the audio gadget for voice calls and chatting as the included 3.5mm audio cable comes with a microphone and makes for an ideal replacement as a headset. The Folding Headphone MP3 player is an amazing portable media device and wireless audio gadget that comes with hard-to-beat convenience and a harder-to-beat price. Available in our warehouse right now, order today and we will express ship it out tomorrow. Great opportunities like this to instantly increase your Ebay store sales can only be brought to you by the leader in Wholesale Electronics and Audio Gadgets - Chinavasion. No more tangling and untangling of your earphone/headphone wires! This Folding Headphone MP3 Player has A-B repeat, what is that? A-B repeat is used to loop a section of a track over and over again. For example, if you really liked the section of music on a track from 1:33 to 3:37, you can use A-B repeat to have it repeat as many times as you want. Can I use these as normal headphones with my phone or iPod?